Samsung Galaxy S4's KitKat firmware or ROM has been leaked by SamMobiles and today we will be telling you or guiding you how to install that firmware on your device. We will be telling you about the features and other tweaks that are made in this ROM. 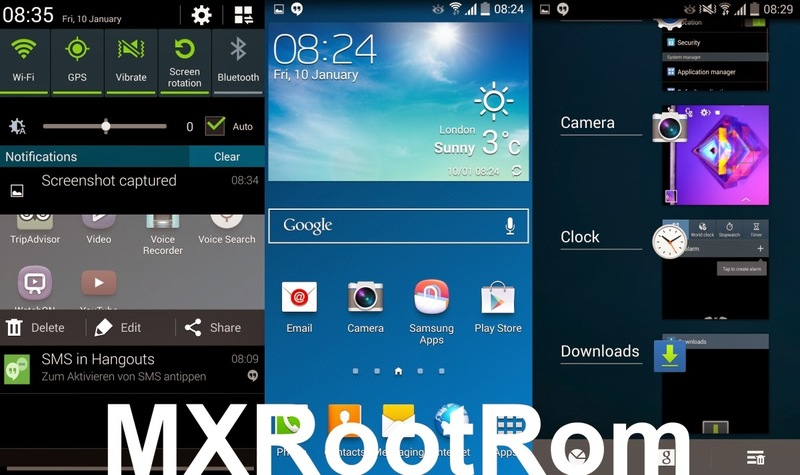 This ROM is just for testing and anyone can test it in his/her Samsung Galaxy S4. With the courtesy of SamMobile, you have official KitKat update for Samsung Galaxy S4. A test was performed with Android 4.4.2 KitKat firmware on international version of Sasmung Galaxy S4 : GT-I9505 with Octa-Core Snapdragon 600 chipset. The firmware is an open release for European Samsung Galaxy S4 users and is said that the ROM is highly functionable and quite stable with just few minor bugs. SamMobile says "so far it’s been pretty stable, except a few minor hiccups here and there" but this is okay because it isn't a final release or a customer release, just a firmware for testing whether it's working correctly or not. Finally Samsung has moved from Green icons to white icons, which are basically stock icons of Google Android 4.4.2 KK OS, so there's nothing 'customized' thing in the statusbar icons. There are some tweaks to the user interface. Also there is a transparent Notificatio bar, which looks cool but nothing done by Samsung here, just tweaked by Google in KitKat update. But, sadly, the interior of notification bar remains same as of Android 4.3 Jelly Bean update for Samsung Galaxy S4, I don't know why Samsung makes their user feels 'not upgraded' because the UI is same! When Google's Nexuses receives updates, they always looks fresh and updated after updating the system by OTA. Another thing that we noticed was the camera icon. The camera icon is now in the lower right side of the Lockcreen which looks like Facebook messenger's popup messages. It allows users to access the camera application as soon as possible when they need it. According to Sam Mobiles, the performance has been significantly improved of Samsung Galaxy S4 with this Android 4.4 Kit Kat build. Also Sam Mobiles reported that the UI is pretty stable with no lags on changing the device orientations. Further, they also said that the Benchmarks of this device seems to be bump up and are better than Android 4.3 Jelly Bean. Note: MXRootRom is not responsible for your bricked Samsung Galaxy S4, if you are an experienced user, then try it at your own risk, other users may also try but on their own risk. If you are feeling insecure, then wait for official release of KK for Samsung Galaxy S4! Download the Firmware given in the link. Extract the firmware with any file extractor like WinRar or WinZip. Download and extract the Odin v3.09 too. Shut down the device and keep it untouched for some time. Now, press and hold Home + Power + Volume down buttons simultaneously to boot into Download Mode. Open the Odin on your PC and connect your PC while pressing those buttons. When you will see blue sign on Odin (the sign means that the device is successfully connected and the drivers are also installed) it means you are ready for the next step. In the AP section, add I9505XXUFNA1_I9505OXAFNA1_I9505XXUFNA1_HOME.tar.md5 file from the folder in which you extracted some files just now. Before moving to the next step, make sure RE-Formatting is not ticked in Odin. Click on the big Start button and have some coffee. Soon it will boot into Android 4.4 KitKat! If you have encourted some errors like Bootloop (Stuck in the Android booting) or any error while flashing then reboot to recovery and choose wipe/factory reset option to reset your internal SD Card and Android software. I9505XXUFNA1_I9505OXAFNA1_I9505XXUFNA1_OXA.zip (or simply Android 4.4 KitKat Stock Firmware for Samsung Galaxy S4): Click here.